Ben and his girlfriend Caren celebrated leaving London (for Birmingham, ew!) 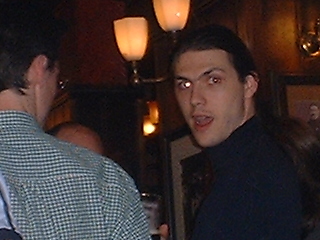 in style with drinks at the Round Table, on 15 May 2002. 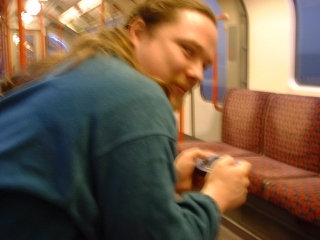 On the way to the pub, Mike played his new GBA on the tube. 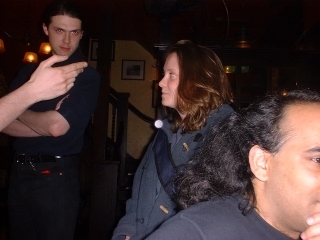 Naomi had to leave us quite early, here she is on the way out, sandwiched between a demonic Dave and a fluffy Ian. 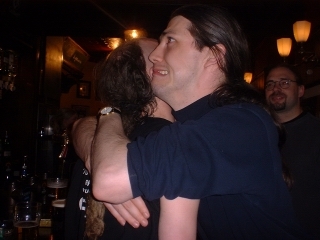 For some reason, Dave gave Steve a great big hug. 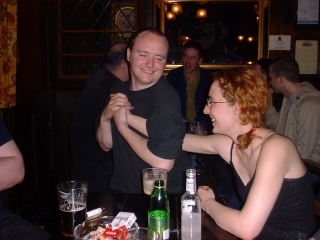 Martin looks on in terror and amusement. Ben and Caren, looking happy together. 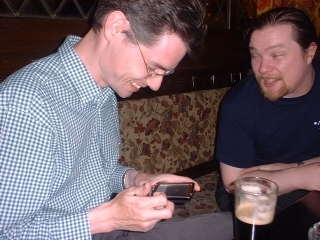 James (Dave's brother) shows Mike the pictures on his PDA. Dave gives me a reproachful look. James had just told him that I didn't feel I'd had sufficient value from the evening. Which sounded dumb, but it made sense to me. And there you have it. Safely on their way to Brum: Ben and Caren.